This hummingbird cake is always a hit with families or for any celebration. 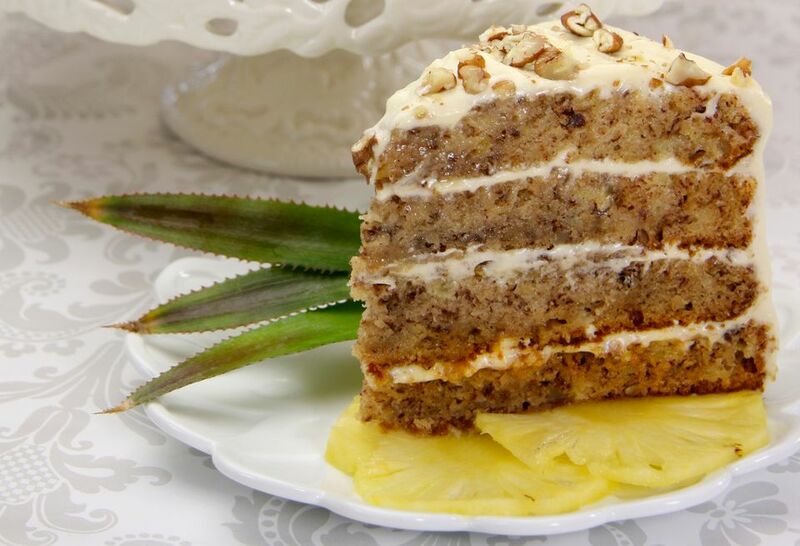 It's a moist cake flavored with cinnamon, pineapple, pecans, and bananas and topped with a cream cheese frosting. The cake originated in Jamaica in the 1960s and was part of an Air Jamaica tourism campaign. It was named the "doctor bird cake," after the national bird of Jamaica. The doctor bird is a member of the hummingbird family. You'll enjoy a little tropical vacation with a cake you can make anywhere and anytime. Wouldn't it be perfect at a bon voyage party for friends who are going on a Caribbean cruise? Note: while there are multiple steps to this recipe, this hummingbird cake is broken down into workable categories to help you better plan for preparation and baking. Preheat oven to 350 F. Generously grease and flour three 9-inch round cake pans. Sift the flour, sugar, salt, baking soda, and cinnamon together into a large mixing bowl several times. Add the eggs and vegetable oil to the dry ingredients. Stir with a wooden spoon until ingredients are moistened. Stir in vanilla, drained pineapple, and 1 cup pecans. Spoon the batter into the prepared cake pans. Bake the layers in the preheated oven for 25 to 30 minutes or until a wooden pick or cake tester inserted in center comes out clean. Cool in pan for 10 minutes, then turn them onto cooling racks. Cool completely before frosting. To make the frosting, combine the cream cheese and butter in a mixing bowl with an electric mixer; beat until smooth and creamy. Add the confectioners' sugar and beat on low speed until combined. Increase the speed to medium-high and continue beating until the frosting is light and fluffy. Frost the tops of all three layers of the cake and then stack them. Sprinkle the top of the cake evenly with the 1/2 to 1 cup chopped pecans. To toast the pecans, spread them in a dry skillet over medium heat; cook while continually stirring until the nuts are lightly browned and aromatic. Remove to a plate at once to stop the cooking process.